I bided my time for the first screenings’ hype to pass, hear opinions and then to go to the cinema for ‘Aquaman’s’ third screening week. The hall was full, despite it being a post-midnight screening, with people of various ages (next to me was a dad sitting with his 13-something-year-old daughter). Smelt ‘family friendly’ already. First though, I better make a prologue about my interpretation of the DC Cinematic Universe to dodge becoming misunderstood. Alright, being a comics fan, I lean more towards the Marvel camp on a level of knowledge and taste, but always flirting with the ‘other side’, so I shan’t compare the movie to the comic but evaluate it as a film of the genre. Having watched the Zak Snyder’s DC trilogy (Man of Steel, Dawn of Justice, Justice League), I too felt the escalating disappointment like many others, and not because, as it has been speculated, Warner was trying to duplicate the Marvel success. Snyder, with an unconventional attitude to classic super hero depictions, had a very specific vision and was always outspoken about it. His purpose was to create a relatively anti-heroic, ‘dark’, realistic super-hero universe. Perhaps he wanted to experiment with the ‘Watchmen’ idea, maybe he’s a fan of the awesome ‘Injustice’ beat ’em up (I doubt though if he’s mindful of the comic of the same name). Somehow, however, the basic point of the genre was lost. This point of view would be meaningful after a world of “colorful” characters had been established, interested the viewers, who would have experienced individual stories and then an all-encompassing story arc. Much like Marvel, but this is not the case. It may have already been done in other dc media (comics and animated series), and perhaps some characters (Batman & Superman) had already established themselves in cinematography (by other creators of different times). After consolidating with intriguing, lingering stories that make the characters relatable, it would then be meaningful to a ‘dark styled’ subversion. For me, subversion as a starting point equals to self-sabotage. Luckily, Warner now seems to understand, as it was demonstrated by the “Wonder Woman” success. A movie (without Snyder) that manages to make us familiar with its world and characters. A movie, which by my estimation, if it had come out before the Snyder trilogy, would have gone much better in the box office and the audience would be more open to it. 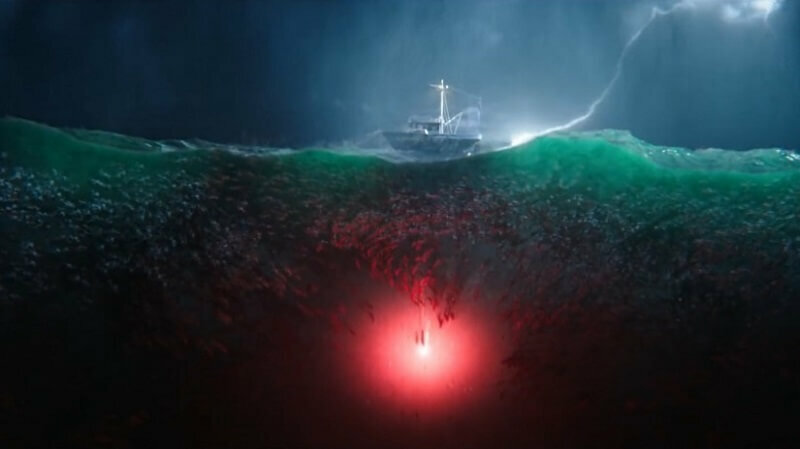 This is something ‘Aquaman’ continues on successfully by cutting off most of what has preceded in order to offer a ‘self-luminous’ origin story. 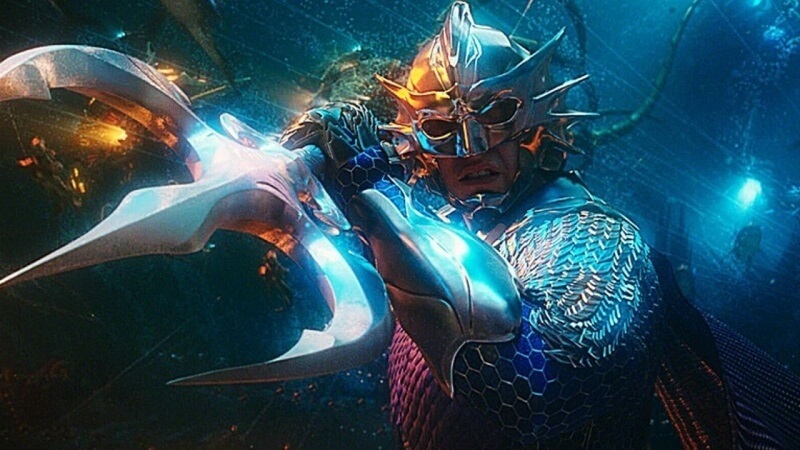 This origin story to put in brief words, portrays the half-human, half-atlantean Arthur Curry (by a peculiarly mellow but ever-sardonic Jason Momoa), who is violently drawn from his sport of protecting the navy from pirates and saving fishermen, and has to face the invasion of his Atlantean half-brother, King Orm (by an excellent Patrick Wilson) with all the forces of Atlantis. 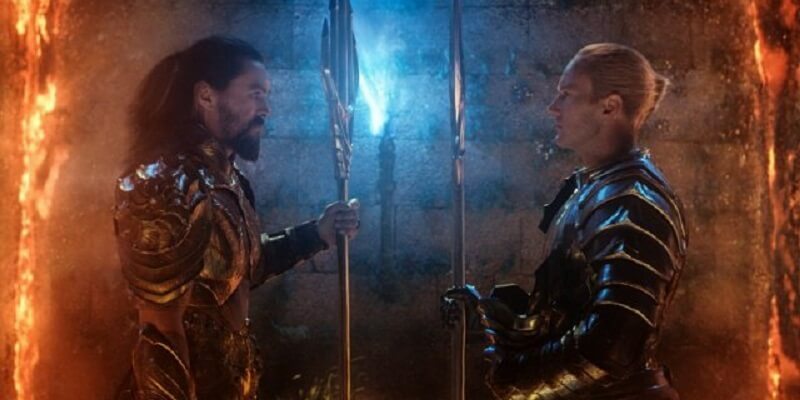 This will be accomplished by confronting his past, accepting his identity and become the rightful king, by finding the powerful trident of his ancestor. Cheesy script, right? Fortunately, ‘Aquaman’ is not just a script. By my standards, the director is the one laying the foundations of a good film. The director is who will judge the actors and direct them in their interpretation, just like everything else. Directing is not just about camera angles and other ‘stale’ technical issues. The director is the first to tell the story. James Wan (1st Saw, Conjuring, Insidious) had already demonstrated his creativity as a skillful, atmospheric narrator. So here is his clear vision with a conscious ‘cartoony’ style and relentless adventurous rhythm. Many times the characters are withdrawn from the forefront of the story’s pace and are presented minimalistically, nevertheless not incomplete, so they do not leave behind any discontinuities in the otherwise easy scenario. They seem to act as pawns on his chessboard so that the structure of the world shown to us keeps our interest undiminished. For his narrative, Wan follows the formula of the ‘Treasure Hunt’ story, a-la Indiana Jones scenario, bringing to mind his ‘teachers’: Spielberg, Lucas and Cameron. Admittedly, some short scenes, various flashbacks of the hero’s childhood years, and Arthur’s failures until the base of the story is established and the mission for the hunt of the trident commences, there’s a reasonable delay up to the middle of the movie, after which it sets ‘on course’. However, this is not something really tiring. All the time we are thrown into action scenes, a slugfest with pirates, chase-scenes in the ocean depths and we are presented with a lush underwater fantasy world with life-teaming ecosystems, civilizations, strange landscapes and of course the spectacular Atlantis itself. Wan’s world-building is such a labor of love, and it shows! For me, the visual psychedelia of the film can be compared to a few others of its kind, such as ‘Thor: Ragnarok’ for example. The antagonists remarkably, although somewhat rigid in their expressiveness (see Black Manta), are absolutely justified with a realistic ‘agenda’. Ocean Master specifically, keeps his ecological motivation from the comic book. Everyone, even the second-rate characters, acquire a romantic, epic quality (much like “Star Wars” and “Lord of the Rings”), which, of course, fits like a ‘glove’ into a story inspired by classical mythology. At the same time, the film seems to be possessed by a well-mannered degree of self-sarcasm, so that the epic element does not stifle us. The dialogues carry nuggets of spontaneous humor, almost like improvisation seemingly, balancing out the over-the-top epic-ness. The musical rendering intensifies the feeling of grandeur and the adventurous pace of the various trips of the mission. Again, the wardrobe seems to follow the director’s taste on ‘cheesiness’, supporting the exaggerated fighting poses of the characters, looking like they came out of ‘vintage’ Asian action series, like Power Rangers and 80’s anime. All of this does not bother us in the least because they really look like part of a healthy retro-love. But let’s get to the c.g.i of the movie that even the haters are inclined to acknowledge. This c.g.i brought back memories of Avatar, with explosions of color and fast but at long last CLEAR to watch action scenes (few films of the genre have mastered them). Underwater battles are clearly offered for experimentation, being in a three-dimensional world, without levels, where it is easy for the measure to be lost. 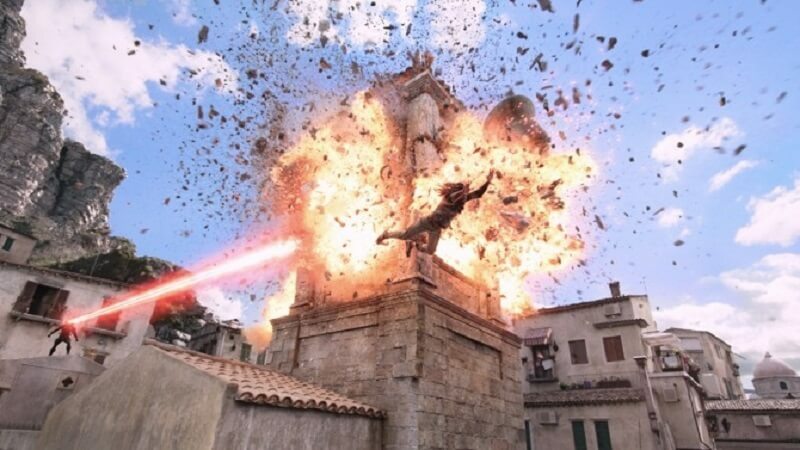 But here is where James Wan’s mastery shows, culminating for me, in the chase at the rooftops of Sicily in a parkour battle. ‘Aquaman’ is not a revelation really. It was the bad previous course of the DC films that had set the standards so low and as a sincere comic fan, when there seems to be a positive step towards the right course, I feel like I ought to overbid. Otherwise, the movie is surely worth watching on the big screen and perhaps such a viewing will make visible the ‘red herring-homage’ of the director at the end of the first scene with a little book on the living room table, of a favorite author of ‘cosmic horror’.